Rated 5 out of 5 by John C from Not Quite the Same I have fired the consumer packaged product, a long side of the LE 147gr HST, over a chronograph and found that the standard deviation in velocity is much higher then the LE line. The LE ammunition is far more consistent, exhibits much less muzzle flash and particulate ejecta. This leads me to believe, that sporting propellant is used in the consumer packaged ammunition. Rated 5 out of 5 by DaveT55 from Solid Defensive Round An LEO friend recommended this as a good defensive load to use in my carry pistol. I've seen several reviews of this type of round: a +P load pushing a heavy HP bullet, yielding a "subsonic round". Apparently well accepted in the LE community. I carry an S&W M&P 9, 4 1/4" barrel. 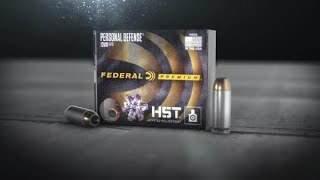 There is little if any difference in felt recoil or point-of-impact between this ammo and the Winchester "white box" 115 gr FMJ range ammo that I use for practice. Rated 5 out of 5 by Chop from I love this Ammo. But it’s hard to find a + P load. Rated 5 out of 5 by Michigan Deputy from HST & Everyone Trying To Be 147 HST 9mm has to equal in personal defense, law enforcement, or any other application where nothing but the best will do. Countless law enforcement agencies issue this with complete confidence and after thirty-eight years of military and police firearms instructing I can say I have never seen a bullet that performs to the level of HST.